UPDATE: Calling legal professionals and clergy for Troy Davis. Yesterday I wrote about Troy Davis and the fact that he has been sentenced to death for a murder that he almost certainly did not commit. Despite copious evidence pointing to Mr. Davis’s innocence, the state of Georgia will likely give him an execution date in September. In that post, I asked that you watch a video and sign the Amnesty petition, but Jen Marlowe pointed out that if you are a legal professional or member of the clergy, you can take an extra, crucial step: Joining a sign-on letter to demonstrate that those most familiar with the law, and those most intimately attuned to this nation’s spiritual and ethical standards, support Mr. Davis in his request for clemency. Legal professionals can sign the appropriate letter by clicking here; members of the clergy can add their names by clicking here. This cannot be stated baldly enough: Troy Davis may soon be put to death for a crime he almost certainly did not commit. Please ask someone you know to join you in taking a stand. Because The People Might Need It open thread. Ta-Nehisi is clearly around and posting, but he’s two hours late on the open thread, and here I am, just getting back to my desk. So, just in case the folks need it: Consider this thread open! I’ll lead with dmf’s latest video offering which, I hasten to point out, really happened. It was songified, but the words of the prayer — all of the words of the prayer — actually came out of the pastor’s mouth. Boogity Boogity. Also: Hey guess what? Nicholas Kristof tweeted a link to this blog yesterday — from Tunisia! “Why’s that?”, you say? Because I emailed him about the information included in yesterday’s post, and he decided to help Troy Davis out. Please, do likewise. Read the post (that’ll take about 60 seconds), watch the video (73 seconds) and then sign the Amnesty petition (30 seconds). Two and a half minutes, and you will have helped save an innocent man from execution. UPDATE: If you are a legal professional or member of the clergy, please click here to read an important update. Let me get this out of the way: I am opposed to the death penalty under any circumstances. I think that Adolf Eichmann should have been allowed to rot in prison. I don’t think that killing people helps society in any way, if it’s not absolutely necessary for reasons of defense, and I don’t believe that the death penalty acts as any kind of deterrent. And yet, I do understand the impulse behind the death penalty. Some people really have done monstrous things, and I can understand the desperate feeling that such monsters produce in our hearts, the horror, the sense that monsters do not deserve to live. But at the very least, should we not be absolutely certain that the person about to be executed is, in fact, a monster? Did, in fact, do what we’re killing that person for doing? In spite of all of this, and much more, Mr. Davis remains on death row. He has already lived through execution dates (once coming within an hour or so of death — stop and imagine that for a minute) only to win a stay each time — but a stay of execution is procedural. Mr. Davis is still in danger of being killed for a crime that, at the very least, it is entirely possibly that he did not commit — and he will likely be given a new execution date in September. If you have 73 seconds to spare, please watch the following video, made by my friend Jen Marlowe, who has done holy work in bringing Mr. Davis’s case to the public eye for years (if you have a bit more time, you can watch the series of four videos in which the shorter clip’s themes are fleshed out and more details provided). Please, please: Sign the Amnesty petition — Amnesty has wisely taken no stand on Mr. Davis’s guilt or innocence, maintaining only that in a case this riddled with doubt, no one should be put to death. Because I find this conviction and this sentence so troubling, what I would like to see the Parole Board do is not only exercise the power of clemency to set aside the death penalty — I think that is an absolute moral and legal necessity in this case, if for no other reason than it is so terribly unfair to the jurors themselves who allowed this death penalty to proceed when the evidence on which they relied has now been disproved and some of it withdrawn by the state itself…. A verdict that is not ironclad is not good enough to support the death penalty. Please do these two small things — watch the following video, and click here to sign the petition — and then do one more thing: Tell someone else. 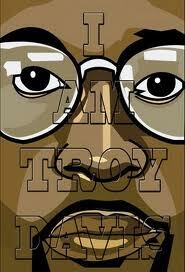 Simply put, there is nothing on earth that justifies putting Troy Davis to death. Please do what you can to save his life. Update – Confidential to newcomers from Boing Boing: Hi! This is an odd place, covering everything from Star Trek to Middle East violence. Please take a look around! First comments go into moderation, so if you’re stuck there over Shabbat (when I don’t work), don’t worry. I’ll fish you out as soon as I can. In the world of The Horde, aka the commenters at Ta-Nehisi Coate’s excellent blog at The Atlantic, we enjoy a weekday noontime (EST) gathering, when our host opens an Open Thread. He’s been largely unavailable for such fun and games over the past couple of weeks, though, so I’ve been filling in as best I can. But I have this feeling that with the weather insanity about to hit the East Coast, some of our number might feel the need for a place to gather over the weekend, so I thought I’d offer this up — and please note that even if you’re not a regular at TNC’s place, you’re more than welcome to jump in! We’re literally known across the blogosphere as a warm and welcoming crowd. (On the other hand, if this winds up being of no interest, I will quietly delete it and no one will ever be the wiser!). If you live anywhere in the path of Hurricane Irene? Please, please: Be smart and be safe. Take pictures of whatever property might be damaged in the course of events, to make it easier to file claims later (this advice courtesy of commenter and internet pal taylor16! ), check in with your neighbors (especially the older and/or more disadvantaged ones), and don’t sleep in bedrooms under dead trees (or, in other words, get yourself to the safest place you have!). A final note: I don’t work on Shabbat, so any comments that get caught in moderation might not show up until tomorrow evening — I’ll clear you out as soon as I can! If you’re new to the party, you can take a gander at the About Commenting page, but the rules, such as they are, boil down to: Be a person. Note that the boy is handcuffed with plastic binders. I don’t know how to write about this. Is any of the information in the following surprising, or even genuinely new, to me? No. I’ve been reading and writing and protesting the horrors of the occupation for many, many years now, and I know that this is what a lot of Israeli soldiers do. I know, and when I forget, books like Sami al-Jundi’s Hour of Sunlight or organizations like Breaking the Silence or B’tselem come along to wake me up. But there is a point at which I put things out of my mind in order to not lose it entirely. I don’t always try to think particularly hard about the abuses. I share and respond to whatever information comes my way, and then I turn away, at least a little. So: Surprising? New? No. But positively infuriating. Enraging. Stomach-churning. And leading directly to the question: And you wonder why they hate us? During the nearly six-hour video, 14-year-old Palestinian Islam Tamimi, exhausted and scared, is steadily broken to the point where he starts to incriminate men from his village and weave fantastic tales that he believes his tormentors want to hear. This rarely seen footage seen by The Independent offers a glimpse into an Israeli interrogation, almost a rite of passage that hundreds of Palestinian children accused of throwing stones undergo every year. In most cases, children as young as 12 are hauled from their beds at night, handcuffed and blindfolded, deprived of sleep and food, subjected to lengthy interrogations, then forced to sign a confession in Hebrew, a language few of them read. Israeli rights group B’Tselem concluded that, “the rights of minors are severely violated, that the law almost completely fails to protect their rights, and that the few rights granted by the law are not implemented”. 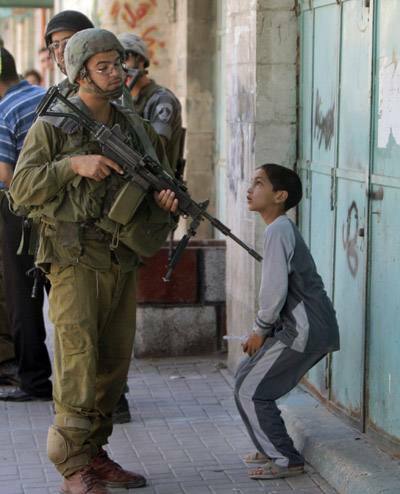 7,000 The estimated number of Palestinian children detained and prosecuted in Israeli military courts since 2000, shows a report by Defence for Children International Palestine (DCIP). 87 The percentage of children subjected to some form of physical violence while in custody. About 91 per cent are also believed to be blindfolded at some point during their detention. 12 The minimum age of criminal responsibility, as stipulated in the Military Order 1651. 62 The percentage of children arrested between 12am and 5am. The follow-up question being, of course: Hey, Israel – how’s that working for you? Are your civilians safe from 12 year olds yet? Or the angry, embittered, often physically damaged men some of them grow to be? The “It’s 12:30 EST. Do you know where your Ta-Nehisi is?” open thread. Have at it, oh mighty Horde. If you’re a newcomer – please scroll down and poke around! You may well find something of interest, and if you do, please do comment, and come back. (If you happen to already know me as an Israel/Palestine writer, here’s all that joyful palaver). 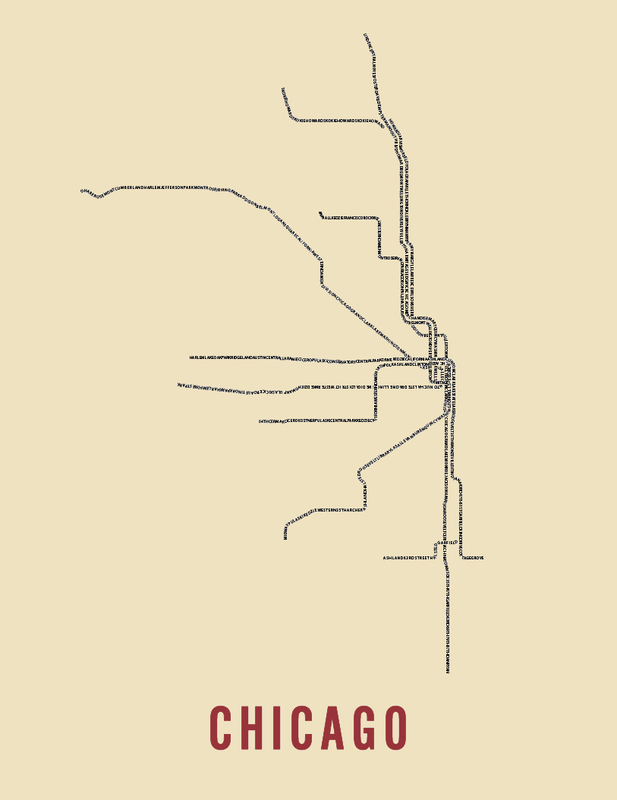 This is a minimalist typographic map of Chicago’s L system. I have a birthday coming up. The Ta-Nehisi Coates Is A Very Busy Man open thread. It looks like TNC is going to be good on his word and not post a lot this week, so here ye be: A thread, and it is open. Again: To all newcomers – Thanks for swinging by! If you scroll down and poke around, you’ll notice that I write about a rather ridiculously wide array of things, some funny, some tragic, some local, some international. And so on! I hope you find something of interest, and please do comment, and come back. (If you happen to already know me as an Israel/Palestine writer, here’s a link to all of that). I’m going to move a couple of late comments from yesterday’s thread into this one — I’d hate for anyone to feel left out! I’m not Canadian, and though I’ve recently tried to get a little bit more abreast of Canadian politics and culture (starting with the wonderful Canada! How does it work?, by Canadian extraordinaire Michelle Dean, at The Awl), I will confess that I had only the vaguest notion of who Jack Layton was before he died of cancer this week at age 61.
Who he was, was leader of the opposition New Democratic Party, but by all accounts, Jack Layton was also much more than that. I’m only beginning to learn, but I’ve learned enough to wish that I could have voted for him, and that he might still be alive and well up north of me, making the world a better, more loving place. I say “loving” because commenter corkingiron tells us that Mr. Layton apparently advised the men with whom he worked to use words like “love” and “compassion” and “nurture” more often, and the barrage of quotes that Mr. Layton’s admirers are now sending around the internet feature the word “love” quite a lot. Love — in politics. Now that is a concept to bring tears of gratitude to my eyes. At any rate, I wanted to share the above picture of what are being referred to as Mr. Layton’s final words — for, knowing that he was dying, he wrote a letter to Canada just this past Saturday. It was released within hours of his death on Monday — the above are the words with which he chose to close his farewell. 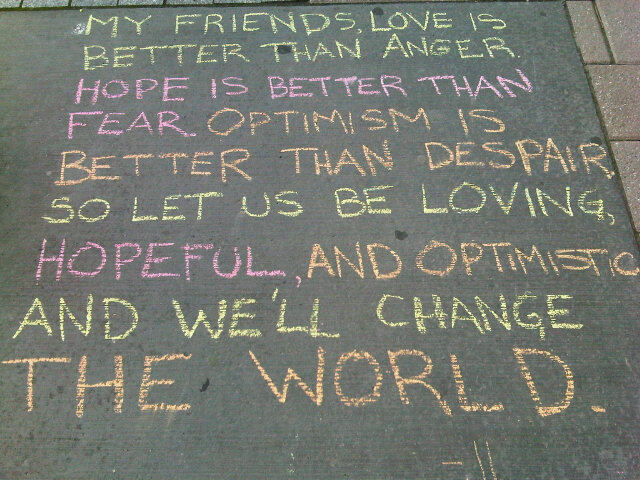 (I’m thinking that whoever chalked those words on the sidewalk must have done so as part of the larger ad hoc memorial outside of Toronto’s City Hall, but I don’t know for sure). The entire letter is a beautiful thing, both in the writer’s clear desire to continue to help the people and causes in which he believed as they continue to work to achieve their real-world goals, and in his simultaneous ability to transcend party and politics and appeal to all who might be reading his words, particular those who might be struggling with cancer. It made me think of Lincoln, frankly, and I urge you to read it, and I thank commenter JHarper2 for providing it in yesterday’s open thread. You might want also to read these tributes, left in today’s open thread by caoil: An open letter to my generation and A Tribute to Jack Layton (from the White Ribbon Campaign, “the largest effort in the world of men working to end violence against women”). Clearly, Mr. Layton was well-loved, and with good reason. What really slays me is that as he lay dying, he wrote in the future tense. Update: Please also check out this blog by the woman who brought the chalk to Toronto City Hall in the first place, and then click on this gobsmacking picture of the square in front of city hall, post-chalk (both thanks to my Twitter pal @rosefox). h/t Paul Dewar, Member of Parliament for Ottawa Centre and New Democrat Foreign Affairs Critic. The I’m Not Sure What The People Might Want open thread. Yesterday Ta-Nehisi linked to me from his wildly late open thread, essentially deputizing me as his bouncer. Squee! That was/remains/will never not be very cool! And then he posted something else. And since then: Nothing. First of all to all newcomers – helllooo! And welcome. If you scroll down on this front page, you’ll notice that I write about a lot of things, which (just on this page) range from ancient myths to Star Trek, wars in the Middle East to America’s war with our bodies, famine and domestic violence to comedy. I’m all over the place, here. I hope you stick around and poke around and find some stuff you like, and come back! If you happen to already know me as an Israel/Palestine writer, here’s a link to all of that. I really do try to be funny, now and then! And that leaves us with the question of the hour: Do the people need a shiny, new, Wednesday open thread, what with the late-night thread still floating so close to the top at Ta-Nehisi’s place? I can’t really tell. I’m not a mind-reader, is what I’m saying here. And who knows what his plans are today? Again with the not reading of the minds. So! I’mma leave this right here and open and if the people want to use it — use it they may! And maybe I’ll actually manage to get a normal post up, myself!